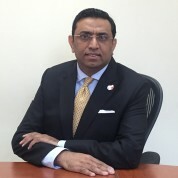 Dr. Ali Adnan Ibrahim is First Vice President of the Al Baraka Banking Group in Bahrain, where he specializes in market-based strategies for economic development, corporate sustainability, Islamic micro-and-SME finance, M&A and Sharia-structuring. Dr. Ibrahim is a World Economic Forum Young Global Leader and an Adjunct Professor of Law at Georgetown University. Previously, he was a Counsel at Baker & McKenzie. Ibrahim has extensive experience in structuring large Islamic finance transactions and has worked on multi-billion dollar transactions involving international project development and finance, M&A, FDI, capital markets, etc. As Fulbright Scholar, he received his Doctorate in financial regulation from the Georgetown University Law Center. He has twice served as Co-Chair of the Islamic Finance Committee of the American Bar Association. Dr. Ibrahim has published internationally on Islamic finance and its regulation, Islamic microfinance, comparative corporate governance and capital markets in the developing countries. I cannot imagine a way to appropriately thank for the kindness, generosity, passion and dedication of our teachers. The Global Teacher Prize is a great way to begin acknowledging their continued, invaluable contributions.